Coit Tower is an iconic site on the San Francisco skyline. This simple tower crowns Telegraph Hill overlooking the San Francisco waterfront. Visitors come to Coit Tower mostly for the views: to see the sweeping waterfront vistas from the parking lot and observation deck, and for the cityscapes best seen from the small park behind the tower. Most people go to Coit Tower for the views, but they miss the best thing about the tower: the fresco murals in the lobby. They're a collection of 25 artworks created in 1934 as part of a Public Works of Art Project. Done in Diego Rivera's social realism style, they are sympathetic portrayals of the daily life of working-class Californians during the Great Depression. They're also like a little time capsule of San Francisco life in the 1930s, especially the big city scene on the side opposite the entrance door. You might think they're attractive or charming, but you probably wouldn't guess that this simple tower was once at the center of political upheaval. In 1934, some people thought the murals were subversive and depicted "Communist" themes. Protests delayed Coit Tower's opening for several months. The working community was already outraged by the shooting deaths of two strikers during the Longshoremen's Strike of 1934, and this delay got them even more upset, adding to a general distrust of authority. You can see several of the murals by walking around the lobby, but you may not understand them without someone to fill you in on their significance, and some are hidden from the general public. They continue behind a door next to the gift shop, up the stairs and around the second floor. To get behind that closed door and learn more take one of the free, guided Coit Tower tours given by City Guides. You can also arrange for a paid tour for groups of four to eight people through San Francisco Parks and Recreation. If you're planning a trip to Coit Tower, make sure to do some research ahead so you know how to make the most of your visit. Don't go back down the way you came up. From the top of the hill, you can hike down to the waterfront through a charming neighborhood where the only streets are stairways. What you can see from the top of the tower isn't significantly better than what you can see from the parking lot, so save your money for something else. Despite the fact that Coit Tower has an elevator, it is not wheelchair accessible because of the steps at its base and a short staircase between the elevator landing and the observation level. Parking in the lot outside Coit Tower is for area residents only on weekends (with a permit). Visitors can only park for 30 minutes during the week, and waits to get into the lot can be long. You could take a bus or call an uber, but the street going up to Coit Tower is often the scene of a time-wasting traffic jam. Try to walk up if you can, even it that requires a lot of stops to admire the scenery while you catch your breath. 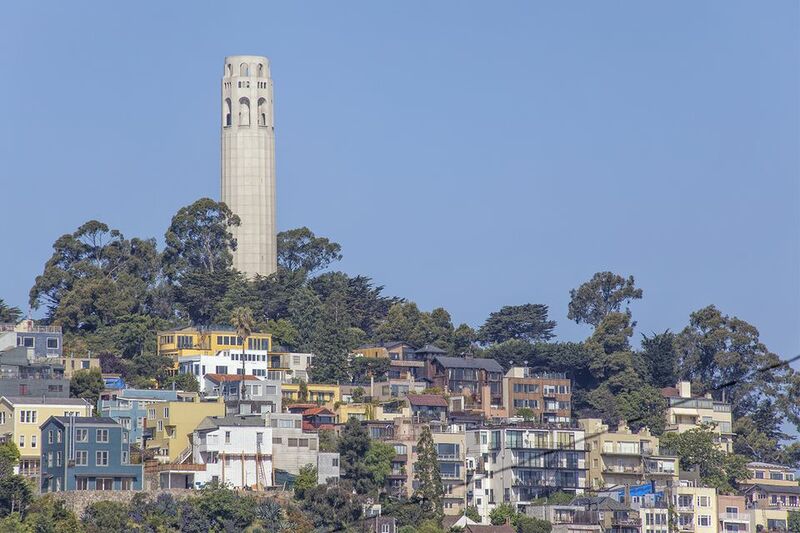 Perhaps the oddest thing about Coit Tower is its story. When wealthy and eccentric San Francisco resident Lillie Hitchcock Coit died, she left funds "for the purpose of adding to the beauty of the city which I have always loved," but she didn't say anything about how to do that. The city settled on a tower, designed by Arthur Brown Jr. and Henry Howard. It resembles the towers on London's Battersea Power Station, completed one year earlier. But here's the funny part: Local tour guides often say it looks like a fire hose nozzle, perhaps because of Coit's well-known love of firefighters. In fact, its shape could be said to resemble any other cylindrical or phallic-shaped object. Use your imagination, and you can make up all kinds of fun things to say about it. The Coit Tower vista point is open anytime, and you can check current tower hours online. The lobby murals and outside areas are free, but you'll have to pay to go to the observation deck. Allow a half hour to walk around and enjoy the scenery, and one to two hours if you go up in the elevator or take the City Guides tour. You can walk up Telegraph Hill to Coit Tower, following Filbert Street from its intersection with Grant Ave in North Beach. To drive to Coit Tower, follow the signs uphill from Stockton Street in North Beach. The #39 MUNI bus goes to Coit Tower, leaving from Pier 39 or Washington Square.